On your first appointment we will take impressions, photos and x-rays. Don't worry, none of this is painful. To qualify for free NHS Orthodontic Treatment you must be under 18 and meet the criteria of Index of Treatment Need (IOTN). 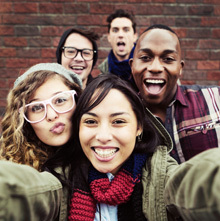 If you do not qualify for free treatment or are over 18 we can still treat you here at Phoenix Orthodontic Practice. We will provide you with full treatment options and related fees prior to any treatment being carried out. If you are experiencing pain, have lost or broken your brace please call the practice as soon as possible. Do not wait until your next appointment. If you need urgent treatment outside of our opening hours please contact NHS 111 for help and advice. When you first have your braces fitted your mouth might feel a little strange and a bit sore. Don't worry this is normal and will improve in a few days. 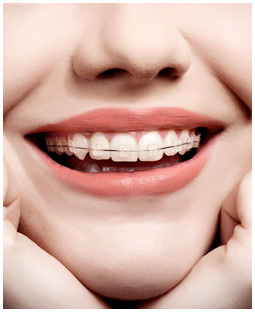 Each time your braces are adjusted by the Orthodontist it is likely to feel sore for about 3-5 days. If necessary, painkillers such as the ones normally taken for headache may help (please read the instructions on the packet, to be given by an adult). The brace you are now wearing is fixed to the teeth for the whole of your treatment. You should not try to remove it, as you may damage your teeth and the treatment will not work. Toffees, boiled sweets, sugared chewing gum, chocolate bars etc. Hard foods which might damage the brace such as crunchy apples, crusty bread rolls etc. Hard foods can be eaten (with care) if you cut them up first. Treatment usually takes 12-24 months but will vary according to how severe your case is. Failed and cancelled appointments or repeated breakages of the brace will add to the overall treatment time. Once the fixed brace is removed retainers will be worn.Please ensure that the advice given by the orthodontist on how to care for your brace and teeth is followed. Regular visits to your dentist is essential throughout your orthodontic treatment. Please call us as soon as possible 020 7473 4411. Do not wait for your next routine appointment as the breakage may slow your treatment, or may result in damage to your teeth. If you repeatedly break your brace your treatment may be stopped and the braces removed altogether. If the appliance is broken more than three times within the course of treatment we may have to remove the brace. Please note: Charges will apply for replacement appliances. Would I need to wear anything in addition to the fixed brace? 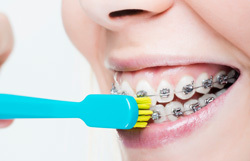 If it is necessary for you to wear anything additional to your appliance your orthodontist will talk to you about this. Headgear are usually worn in the evening and at night. Elastics are worn inside the mouth at all times, including mealtimes. It is important you brush your teeth well, three times a day and use fluoride toothpaste. If possible carry a brush with you for use after lunch. Pay particular attention to brush where the gums meet the teeth. Brushing may take a little longer when you have a fixed brace. A daily fluoride mouth rinse should also be used last thing at night, after tooth brushing, to further protect the teeth. Failure to keep your teeth and the brace clean will lead to permanent scarring of your teeth. Do I need any special brushes? If you have been fitted with a fixed brace we strongly advise that you buy a fixed appliance pack. The pack includes, Orthodontic brush, inter-space brush, disclosing tabs, wax and mouthwash. Please ask at reception. Retainers are designed to keep your teeth straight and are removable. Now that your teeth are straight, if you do not wear your retainer, your teeth are likely to drift towards their original position. If this happens it may be difficult if not impossible to correct. This will vary according to how your teeth originally looked before the orthodontic treatment was started. However, as a general rule you will be asked to wear a removable retaining appliance for at least 12 months. This may mean wearing it all the time for the first 6 months, before going onto just night time wear. You will be advised if long term wear is required. Your speech may be different. Practice speaking with the brace in place, read out loud at home on your own and your speech should return to normal within a couple of days. You may also find yourself swallowing a lot to begin with. This is quite normal and will quickly pass. It is important you brush three times per day and use fluoride toothpaste. If possible carry a brush with you for use after lunch/meals. Take the brace out to clean your teeth. You should gently brush the brace, taking care not to damage the wires. A daily fluoride mouth rinse should be used last thing at night, after tooth brushing. Failure to keep your teeth clean will lead to permanent scarring of your teeth. Yes. The brace is removable but if you have been asked to wear it full time it should only be removed for eating and cleaning. When it is not in your mouth it should be in its protective box. Do not click the brace in and out with your tongue as this can cause the brace to break. If the retainer can't be worn because it is being repaired your teeth may not remain straight. You will not need an appointment so often now the retainers are in place. You will be advised about this. Please bring your retainers to every visit. Yes. It is a good idea to visit your regular dentist now that you are wearing retainers since it will be easier to check your teeth for decay. This is particularly so if you're previous brace was fixed to your teeth. You should obtain a new gum shield now you are in retention. What if I break or lose my retainer? Call us for an appointment as soon as reasonably possible. Do not wait for your next routine appointment. Please note: Charges will apply for replacement retainers. Your speech might be a little different at first. Practice speaking with the brace in place, read out loud at home on your own and your speech should return to normal within a couple of days. You may also find yourself swallowing a lot to begin with. This is quite normal and will quickly pass. If the brace rubs your cheeks or lips, wax can be given by your orthodontist, this will help. Try to continue wearing the brace otherwise you may experience discomfort again when you start wearing it once more. How Else Can This Affect Me? Your speech may be a little different. Practise speaking with the brace in place, read out aloud at home on your own, your speech will return to normal within a couple of days. You may also find yourself swallowing a lot more to begin with. This is quite normal and will pass quickly. If you play a wind instrument, particularly the flute or a brass instrument, then you may be advised to remove the brace whilst playing. However, when the brace is not in your mouth it should be kept in a sturdy plastic box to prevent breakage. Yes you should be able to eat normally. Remove the appliance whilst eating unless you are otherwise instructed. Although it may be difficult at first, eating with the brace and rinse thoroughly. Fizzy drinks, including diet drinks, and excessive amounts of fruit juice. Hard foods which might damage the brace such as crunchy apples, crusty bread rolls etc. Hard foods can be eaten with care if you cut them up first. It is important you brush well two times per day, three if you have a fixed brace and use fluoride toothpaste. If possible carry a brush with you for use after lunch. Take the brace out to clean your teeth. You should also gently brush the brace, taking care not to damage the wires. A daily fluoride mouth rinse should also be used last thing at night, after tooth brushing. Failure to keep your teeth and brace clean will lead to permanent scarring of your teeth. Treatment usually takes 6-24 months but will vary according to how severe your case is. Failed and cancelled appointments or repeated breakages of the brace will increase the length of time the treatment will take. Yes. It will be important you still have regular check-ups with your regular dentist throughout the orthodontic treatment so that your teeth can be checked for decay. What if I break or lose my brace? A functional appliance is a removable brace that works on the upper and lower teeth at the same time. The number of hours per day that you are expected to wear the brace will be explained to you by the Orthodontist. For the treatment to work it is important you follow these instructions. With the correct number of hours wear you may find the improvement in the position of your teeth can be quite dramatic. Your speech may be different. Practice speaking with the brace in, read out aloud at home on your own and your speech will return to normal within a couple of days. You may also find yourself swallowing a lot to begin with. This is quite normal and will quickly pass. You may not be able to eat with your functional appliance in place. You will be advised about this. If you have been told to take it out for eating, make sure it is placed in a tough plastic box for safekeeping. A suitable box will be recommended to you. Call us for an appointment as soon as reasonably possible. Do not wait for your next routine appointment as the breakage or loss may slow your treatment, or may result in damage to your teeth. If you repeatedly break your brace your treatment may be stopped and the braces removed altogether. How does a payment plan work and do I need to pay a deposit? If you would like to spread the cost of your treatment a member of the team will be happy to discuss our payment plan option with you. We will give you full treatment costs and ask you to pay a deposit. This is usually 50% of your treatment cost. After paying the initial deposit, you will pay the remaining balance at each visit and make final payment at the agreed time before treatment is finished. What are the charges if I do not qualify for free treatment? The cost of your treatment will vary depending on the type of treatment you need. You will be given an estimate of costs during the consultation. For a private consultation there is a fee of £150 which if you decide to go ahead with the proposed treatment plan we will deduct this amount from the cost of your treatment. This fee includes x-rays and study models. Most of our patients that do not qualify for NHS Orthodontic treatment will be eligible to pay for their treatment via the payment plan option. However the practice reserves the right to refuse a payment plan application. Usually repayments are approximately £100 at each visit. There is no interest to pay. You can pay off the balance at any stage during your treatment and before the agreed final payment date. What if I cant pay? If for any reason you are unable to make payment of the agreed amounts during we may not be able to reserve you another appointment or complete your treatment.